A domain can contain a wide range of items, including report procedures (FEX), Reporting Objects (special type of report procedure), Alert procedures, documents, dashboards, and Internet hyperlinks. It can also include ReportCaster items if you are licensed for ReportCaster. For information, see the ReportCaster manual. These items are located in folders. Both the items and the containing folder may be private, published, or shared. If you have migrated from an earlier release of WebFOCUS, you will have the Standards Reports, Reporting Objects, and Other Files folders. If you were permitted to create your own reports, you will also have the My Content folder, which was the My Reports folder in prior releases. My Content may contain the Custom Reports, Shared Reports, and folders for each My Report report you created. Published content is considered authoritative and has usually undergone quality assurance and testing before being published for the user community. User access to published content is controlled by rules. My Content. The reports, output, and schedules created by a user. This content remains private to a user unless the user chooses to share it with others or unless an administrative user has the ability to manage private content for that user. Other private content. Private content, which is intended to be accessed by a particular group of developers or which is being prepared for publication. The owners of private resources are permitted a standard set of capabilities for their content. The owner may be either a user or a group, and private content may be shared with other users or groups if the owner has been granted the ability to share that content. The ability to create new private resources inside a published folder is a controlled permission. Reporting Objects are report templates that contain the data source fields that users can select in the InfoAssist reporting tool to build a report or chart. Reporting Objects are typically designed by a developer, administrator, or a user permitted to create Reporting Objects. Permitted users can open a Reporting Object with InfoAssist. Using InfoAssist, users can select fields for the report or chart, manipulate and style the data, and save the procedure, which can be saved as private content in the My Content folder or a folder in which the user is permitted to save reports. For more information on the Reporting Objects tool, see Creating Reporting Objects. When you create a folder, it is private content. Private content appears as a gray folder in the tree. If you share a folder, the folder includes a link icon and is available either to all users, specific groups, or users permitted to access the folder location. If you publish the folder, it appears as a manila-colored folder in the tree and is available to all users. The icons located next to each item represent the item type. In the following table, the first column lists the icons, and the second column describes what they represent. Folder. Allows users to organize their private or published application content. Shared folder. Contains private content a user has given access to all users permitted to access the folder or is shared with specific groups of users. My Content folder. Provides the user with a location to create private reports, output, and schedules. This is created when the parent folder has the Auto create My Reports folder property selected and the user is permitted to create private content in a My Content folder. The private content within this folder cannot be published. Report procedure. Contains the core language commands to tell the Reporting Server how to create the report. Shared reports procedure. Contains report procedures to which the user has given access to all users or a specific group of users who are authorized to access the folder the shared report is located in. Visualization. A graphical representation of your data, comprised of one or more visuals. Visuals can be charts, maps, or grids. Reporting Object. A report procedure (FEX) that is a tailored view of a set of data that groups or individual users use to create personal reports quickly and in compliance with the reporting rules and guidelines of your company. Graph procedure. Contains the core language commands to tell the Reporting Server how to create the graph. Document or dashboard. Customized document or dashboard created in InfoAssist. Schedule. Specifies when to run a report procedure, how to distribute the report (Email, FTP, Managed Reporting, Report Library, Printer), and the destination to which the report will be distributed. This is available when licensed for ReportCaster. Alert procedure. A report procedure that evaluates whether a defined condition is true or a file exists to determine whether to run (trigger) the specified or referenced report request. ReportCaster can be used to schedule and distribute an Alert report and specify how the Alert test should be evaluated after it has been triggered. Distribution List. Used with a ReportCaster schedule (Email, FTP, or Printer) to specify the email addresses, directory locations, or printers to distribute. Library Access List. Used with a ReportCaster Library schedule to specify the groups and users that the private Library report will be shared with. Library Report. Library reports can contain links to web resources (live links) and to other reports (drill-downs). The Report Library provides secure access to library content and it allows the user to save multiple versions of the same report output, set an expiration date, and keep a specified number of versions. The Report Library is only available to ReportCaster users who have been granted library privileges. Watch List Report. A report of particular interest that the user subscribes to in the Report Library. Each time a new version of the report is distributed, the user receives an email notification. StyleSheet file. Specifies how to apply WebFOCUS styling to a report or chart created by the Reporting Server. Cascading Style Sheet (CSS) file. Webpage or a URL to run a report. Note: Images that you embed in reports and HTML pages must be located in the search path of the Reporting Server. Any images that are stored in the repository can be uploaded to the Reporting Server using the WebFOCUS Client setting, IBI_Push_Image. This setting, when set to True, uploads images that are stored in the repository and are referenced by the request being run to the Reporting Server. For information, see the WebFOCUS Security and Administration manual. The following topics describe the context menu options for each type of item. When you right-click an item, the options displayed in the context menu are determined by the selected item type and the tools and features you are permitted to access. For more information, see the WebFOCUS Security and Administration manual. For details about using the Schedule option to schedule reports, see the ReportCaster manual. If you are running large reports, you may need to increase the virtual memory on your machine. See your System Administrator for details. A menu does not appear if you are accessing a Public View of Dashboard. Only the default action is allowed for the list items in a Public View. The context menu for a folder is shown in the following image. Note: The options available for a folder are also available for many other types of items. Opens InfoAssist, where you can create a report. Enables you to create a chart in InfoAssist. Enables you to create a dashboard in InfoAssist. Note: This option is not available in the Accessibility Mode. For more information on enabling and using accessibility features, see WebFOCUS Accessibility Guide. Enables you to create a document in InfoAssist. Opens the InfoDiscovery Workbench, where you can create visualizations. Enables you to create an Alert in Alert Assist. Enables you to create a Reporting Object in the Reporting Object tool. Enables you to create a procedure with the Text Editor. Enables you to create a link to a URL with the Create URL dialog box. Enables you to create a schedule with the Advanced Scheduling tool. Enables you to create a link to a Visual Discovery Analyst Edition (AE) project. Note: This option is only available with a Visual Discovery Analyst Edition license. Enables you to create a Distribution List with the Distribution List tool. Enables you to create a Library Access List with the Library Access List tool. Makes a copy of the item with an underscore and number appended to the title, for example, duplicating Sales_Report creates Sales_Report_1 in the same location. The number is incremented each time a duplicate is created. Cuts, copies, or pastes the folder and its contents. Deletes the folder and its contents. Enables you to change the folder title. The Title is the value that displays in the tree. Note: Changing the folder Title value does not change the folder Name value. Refreshes the content of the folder. Enables you to upload a data file, document, or image. Note: Upload options may appear differently across browsers, because each browser utilizes its own upload dialog box. Open the Search dialog box, where you can search define a search query. For more information, see Search Dialog Box. Allows or suppresses public access to the content. Shows or hides the item. Enables you to share or unshare the folder with all users that are permitted to access the folder the item is located in. Enables you to share the item with specific groups or users that are permitted to access the folder the item is located in. Provides access to the security rules defined on the folder. Shows the security rules for the folder. Shows the defined rules that specify the permitted functionality on the folder. Allows you to set the resource owner, either Published (no specific owner), or a specific group or user. Shows the properties of the folder. Enables you to create or edit a synonym using the Web Console. Launches the ReportCaster Explorer, passing the selected folder location for which the ReportCaster Explorer will obtain and display information. The context menu for an Alert, report, graph, procedure, or document is shown in the following image. Note: The options available for report and graph procedures are also available for many other item types. Like folders, report and graph procedure options include the Duplicate, Cut, Copy, Delete, Change Title, Publish/Unpublish, Show/Hide, Share/Unshare, Share with, Security, and Properties options, as described in Options for Folders. Note: Documents and dashboards have the same options as report and graph procedures with the exception of Publish/Unpublish. Runs the report procedure or schedule. Submits a report procedure or a schedule for deferred execution. Runs a report and includes an SQL trace of the report results. Schedules a report procedure. Scheduling options include Email, FTP, Printer, Report Library, and Repository. Edits an item with the tool that was used to create it. Provides the options of editing an item in InfoAssist or in the Text Editor. Adds the item to the Favorites folder. Adds the item to the Mobile Favorites folder. The context menu for a visualization is shown in the following image. Like folders, visualization options include the Duplicate, Cut, Copy, Delete, Change Title, Publish/Unpublish, Show/Hide, Security, and Properties options, as described in Options for Folders. Like report procedures, visualization options include the Run, Edit, Add to Favorites, and Add to Mobile Favorites options, as described in Options for Procedures (FEX). Note: The Run Deferred and Run with SQL Trace options are not available for visualizations. Provides the options of editing a visualization in the InfoDiscovery Workbench or in the Text Editor. The context menu for a Reporting Object is shown in the following image. Like folders, Reporting Object options include the Duplicate, Cut, Copy, Delete, Change Title, Publish/Unpublish, Show/Hide, Security, and Properties options, as described in Options for Folders. Like report procedures, Reporting Object options include the Run, Run Deferred, Edit, Add to Favorites, and Add to Mobile Favorites options, as described in Options for Procedures (FEX). Enables you to create a new report, chart, document, or dashboard using InfoAssist. There are two types of Save Parameter reports. One can be a procedure (FEX) created from the Autoprompt page, described here. The second type, a Save Parameter report created from an HTML Composer page, is described in the following Reference. The context menu for a Save Parameter report procedure (FEX), created from an Autoprompt page, is shown in the following image. Like report procedures, Save Parameter report procedure (FEX) options include the Run, Run Deferred, Run With SQL Trace, Schedule, Edit, Add to Favorites, and Add to Mobile Favorites options, as described in Options for Procedures (FEX). Like folders, Save Parameter report options include the Duplicate, Cut, Copy, Delete, Change Title, Share/Unshare, Share with, and Properties options, as described in Options for Folders. Enables you to edit report parameters previously saved from the Autoprompt page before running the request. The context menu for a Save Parameter report from an HTML Composer page is shown in the following image. From an HTML Composer page, an HTML Save Parameter report is created and has context menu options consistent with the HTML file type, as described in Options for Excel Workbooks, PDF, HTML, and Image Files. The Edit option will display the HTML page with the report parameter values previously saved from the HTML Composer page. The context menu for a Schedule is shown in the following image. Like folders, schedule options include the Duplicate, Cut, Copy, Delete, Change Title, Publish/Unpublish, Show/Hide, Share/Unshare, Share with, Security, and Properties options, as described in Options for Folders. Like report procedures, schedule options include the Edit and Run options, as described in Options for Procedures (FEX). Launches the Schedule Log Options dialog box from which you can select whether to view the most recent log report for the schedule or specify a time range for which to obtain log reports. The context menu for a Distribution List or Library Access List is shown in the following image. Like folders, Distribution List and Library Access List options include the Duplicate, Cut, Copy, Delete, Change Title, Publish/Unpublish, Show/Hide, Show/Hide, Share/Unshare, Share with, Security, and Properties options, as described in Options for Folders. Like report procedures, Distribution List and Library Access List options include the Edit option, as described in Options for Procedures (FEX). The Edit option invokes the Distribution List and Access List tools. The context menu for a StyleSheet is shown in the following image. Like folders, StyleSheet options include the Duplicate, Cut, Copy, Delete, Change Title, Publish/Unpublish, Show/Hide, Show/Hide, Share/Unshare, Share with, Security, and Properties options, as described in Options for Folders. Like report procedures, StyleSheet options include the Edit and Add to Favorites options, as described in Options for Procedures (FEX). The Edit option invokes the Text Editor. The context menu for a URL is shown in the following image. Like folders, URL options include the Duplicate, Cut, Copy, Delete, Change Title, Publish/Unpublish, Show/Hide, Show/Hide, Share/Unshare, Share with, Security, and Properties options, as described in Options for Folders. Like report procedures, URL options include the Edit, Add to Favorites, and Add to Mobile Favorites options, as described in Options for Procedures (FEX). Enables you to launch the URL link. The context menu for Visual Discovery AE is shown in the following image. Like folders, Visual Discovery AE options include the Duplicate, Cut, Copy, Delete, Change Title, Publish/Unpublish, Show/Hide, Share/Unshare, Share with, Security, and Properties options, as described in Options for Folders. Like procedures, Visual Discovery options include the Edit and Add to Favorites options as described in Options for Procedures (FEX). Enables you to launch the URL link. Links are appended with run-time token giving access to the Visual Discovery Server AE. The context menu for an Excel Workbook, PDF, HTML, or image file is shown in the following image. 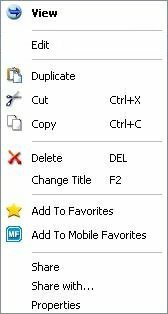 Like folders, these options include the Duplicate, Cut, Copy, Delete, Change Title, Publish/Unpublish, Show/Hide, Security, and Properties options, as described in Options for Folders. Enables you to download a copy of the file to your browser, which will launch the File Download dialog box to allow you to open or save the file. If you choose open, the file will open in its corresponding application. Note: Edit, which is available for HTML files, launches the Text Editor. The context menu for Favorites is shown in the following image. Removes the Favorite from the list. The context menu for Reporting servers is shown in the following image. Like folders, these options include New, Refresh, and Security, as described in Folder Properties. Enables you to sign in to the Reporting server. The context menu for portals is shown in the following image. Like procedures, these options include the Run, Edit, Delete, Change Tile, Publish/Unpublish, and Security options, as described in Options for Procedures (FEX). Displays the language selected for the portal. Removes your own customizations from a portal, and its pages. Removes all user customizations and any custom pages created at run time. Authorized users can select the Properties option to review information about a folder or item, including when it was created, last modified, title, name, and settings that control the Reporting Server and applications it will access. There are also settings that control the functionality available to users when accessing the folder or running or scheduling an item. The Properties dialog box for a folder displays tabs for Main Properties and Server Properties, as shown in the following image. Title. Value displayed in the tree that users use to identify the content within the folder content. Folder Name. Unique reference to the item within the folder. Select the Change Name check box to change the name of the folder. Summary. Detailed explanation that provides additional information about the item. Parent Folder. Previous folder in the folder path of the WebFOCUS repository. Full Path. Full path of the folder in the WebFOCUS repository. Created On. Date the folder was created. Created By. User who created the folder. Last Modified On. Date the folder properties were last modified. Last Accessed On. Date the folder was last opened. Last Accessed By. User who last opened the folder. Properties. Properties of the folder. Run. Displays N/A, as this property is not applicable to folders. Sort Order. Specifies the order to list the folder in the tree. Status. Indicates whether the folder is Published or Private. Private will also display the folder owner information. Prompt for Parameters. Indicates whether to display the Autoprompt HTML page to allow the user to view and select parameter values. When unchecked, users will still be prompted if there are any parameters that do not have a value supplied. Only Run as Deferred Report. Runs the report in deferred mode. Do not show on User's List. Specifies whether to display the folders to users not permitted to create content in the folder. This option is primarily used when the folder needs to be made temporarily unavailable to end users permitted to access the content in the folder. Run With OLAP. OLAP-enables the report. Schedule Only. Indicates that the report can only be scheduled using ReportCaster. Note: This option is not available for use with Reporting Objects. Restrict Schedule to Library Only. Prevents emails distribution for security sensitive scheduled reports, and restricts them to the library distribution only. This option is only available for schedules. Auto Create My Content Folders. Creates My Content folders for users with My Content Folder privileges so the user has a place to save their private content, such as procedures they may create using InfoAssist or report output they save from the Deferred Status interface. For more information on My Content folders, see the WebFOCUS Security and Administration manual. Allow user to Run. Allows a user not permitted to access the Reporting Object tool to run the Reporting Object interactively, using the Run or Run Deferred options. Only allow user to Run. Specifies to not allow users to use InfoAssist with a Reporting Object. Depending on the effective policy, users can only use the Run or Run Deferred options. The Properties dialog box also contains the Security drop-down menu. For more information about the options in this menu, see Options for Folders. The Server Properties tab shows the Assigned Server and available Application Paths. When a Reporting Server is not specified, the report request is submitted to the default Reporting Server specified in the WebFOCUS Client configuration. When an Application Path is not specified, the Application Path defined during the processing of the WebFOCUS Client configuration and the Reporting Server configuration is used. The Properties dialog box for an item displays tabs for Main Properties, Server Properties, Details, and Advanced, as shown in the following image. Title. Value displayed in the tree that users use to identify the item. File Name. Unique reference to the item. Select the Change Name check box to change the name of the item. Summary. Detailed explanation users can view to obtain additional information for the item. Full Path. Full path of the item in the WebFOCUS repository. Created On. Date the item was created. Created By. User who created the item. Last Modified On. Date the item properties were last modified. Last Modified By. User who last modified the item. Last Accessed On. Date the item was last opened. Last Accessed By. User who last opened the item. Properties. Properties of the item. Size. Size of the item contents. Run. Displays whether the report procedure will be run immediately or is restricted to only be run deferred or scheduled. Sort Order. Not available for items. Status. Indicates whether the item is Published or Private. Private will also display the item owner information. Do not show on User’s List. Does not list the Reporting Object in the tree when the user does not have write access. The Details tab displays the components of the report procedure in a tree structure to allow a user to review the request information prior to running or opening the report in a tool. The tree structure displays the request components as folders MasterFiles, DataElements, Sorts, Conditions, Expressions, Output Formats, and Joins that can be opened to show the fields referenced. Note: The Details tab does not support report procedures with Dialogue Manager commands. Dialogue Manager is a part of the WebFOCUS language that allows you to control the flow of your application with the use of variables. For more information on Dialogue Manager commands, see the Developing Reporting Applications manual. The Advanced tab allows you to set default height and width values for the item inside a portal at run time. This tab is shown to developers only on content that can be added to a portal page. The tab is not shown on any content inside a My Content folder. For more information on Reporting Objects, see Creating Reporting Objects.